Frances Daisy Emery Allen. Courtesy of the University of Texas Medical Branch. Image available on the Internet and included in accordance with Title 17 U.S.C. Section 107. 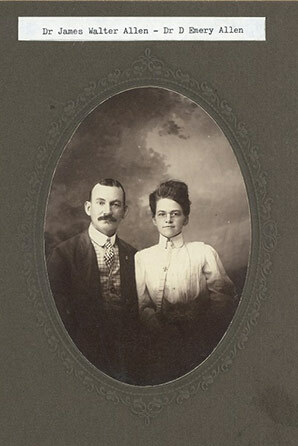 Dr. James Walter Allen and Dr. Frances Daisy Emery Allen. Courtesy of the Tarrant County Archives. Image available on the Internet and included in accordance with Title 17 U.S.C. Section 107. ALLEN, FRANCES DAISY EMERY (1876–1958). Frances Daisy Emery Allen, physician, was born on September 5, 1876, in Kaufman County, Texas, the daughter of James Wallace and Elizabeth Jane (Brown) Emery. When she was a teenager the family moved to Fort Worth, where her father taught school and she attended public school. Her father strongly supported her plan, which she expressed as early as the age of four, to become a doctor; when the Fort Worth Medical School was opened, she talked with physicians she knew, secured an application form, and applied. At first she was refused, but when she pointed out that the entrance requirements did not specifically exclude women, she was admitted to the charter medical class at Fort Worth University in 1894. Three years later she became the first woman to graduate from medical school in Texas, finishing second in a class of seventeen. After graduation she went into private practice, but in 1899 she moved to Washington, D.C., to secure postgraduate training. She returned to Texas in 1901, taught at Dallas Medical College, and had private patients. She married Dr. James Walter Allen, a classmate from medical school, on November 30, 1903. The Allens were partners in a succession of rural practices for the next ten years. They first lived in Vinson, Oklahoma Territory, where James Allen had been residing. They were building a house and an office there when a storm and fire on April 2, 1904, destroyed much of the town. Invited by a resident of Content, Runnels County, Texas, to relocate there, they moved back to Texas and practiced in Content and the surrounding area from 1904 to 1910. When Content was bypassed by the railroad, the Allens moved to nearby Goldsboro, a new town located on the Pecos and Northern Texas Railway. After spending 1910–12 in Goldsboro, they moved to Newark, about twenty miles northwest of Fort Worth. They were making plans to go to China as Methodist missionaries when James died unexpectedly in December 1913. With her two young daughters Dr. Allen returned to Fort Worth, accepted a position as clinical professor of children's diseases at Fort Worth University, and opened a private practice. After the university closed in 1917, she continued her practice, largely with women and children. She was on the staffs of Harris, All Saints, and St. Joseph hospitals and was a volunteer physician at City-County Hospital and Wesley House Clinic. She was a member of both the Tarrant County Medical Society and the Tarrant County Association for Mental Health. She held a life membership in the Texas Medical Association. She retired in 1950 at the age of seventy-four. She died on December 7, 1958, and was buried in Greenwood Cemetery, Fort Worth. See illustration in article HEALTH AND MEDICINE. Daisy Emery Allen, M.D., 1876–1958: Scholarship and Loan Funds (brochure, University of Texas Medical Branch, Office of University Relations). Handbook of Texas Online, Judith N. McArthur, "ALLEN, FRANCES DAISY EMERY," accessed April 23, 2019, http://www.tshaonline.org/handbook/online/articles/fal64.